At the moment the beauty world is ablaze with raving reviews of the newest Chanel foundation which don't get me wrong is rather great and a foundation I do enjoy. However I do want to say don't overlook Chanel Vitalumiere Aqua Foundation particularly if you enjoy light, breathable bases. 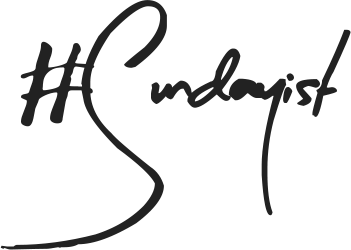 I hate that I am a magpie, give me a gift voucher and I will hone in on the nearest Chanel counter. Chanel sings to my heart like no other brand and the slick, chic packaging is partly for that reason. 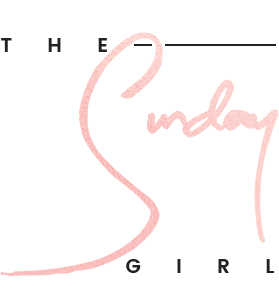 This time around the packaging is more practical that dressing table worthy and when it comes to my foundations that's just how I like things to be. 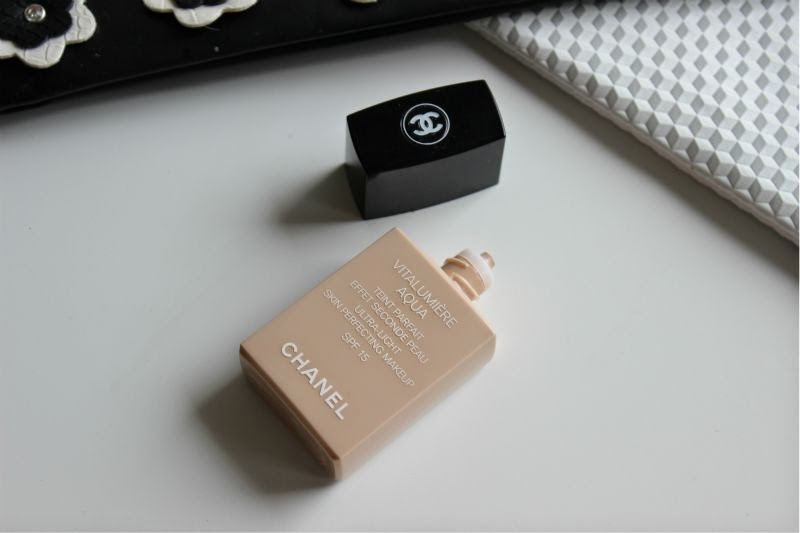 Chanel Vitalumiere Aqua Foundation comes in a flesh toned (the shade of the casing correlates to that of the foundation) bottle in which you squeeze to dispense the product. In my opinion you are best storing the bottle upside down so you don't have to squeeze with too much gusto and perhaps waste product in doing so. A quick glance online shows that Chanel Vitalumiere Aqua Foundation comes in seven shades (at least in the UK anyway) and like most foundations this Chanel offering doesn't cater to those with really pale or deep complexions. One day my friends, one day! What I do like about Chanel foundations is the fact that they offer shades with a yellow undertone or a pink undertone so the colour match is pretty natural. In Chanel foundations I typically wear the shade B30 Beige which I find to be a good match for my NC30-35 skin tone and doesn't have a tendency to oxidise over the course of wear. 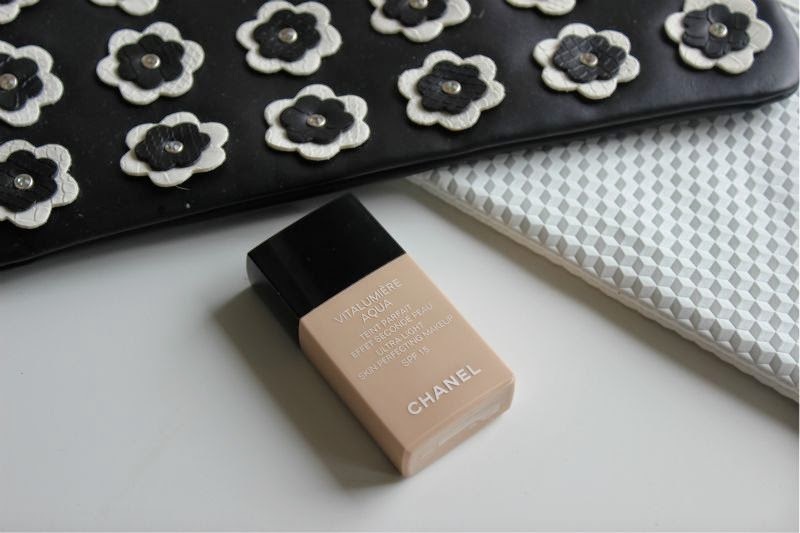 Chanel Vitalumiere Aqua Foundation is a light to medium coverage foundation which I like to use combined with a concealer (typically MAC Pro Longwear Concealer) on good skin days. 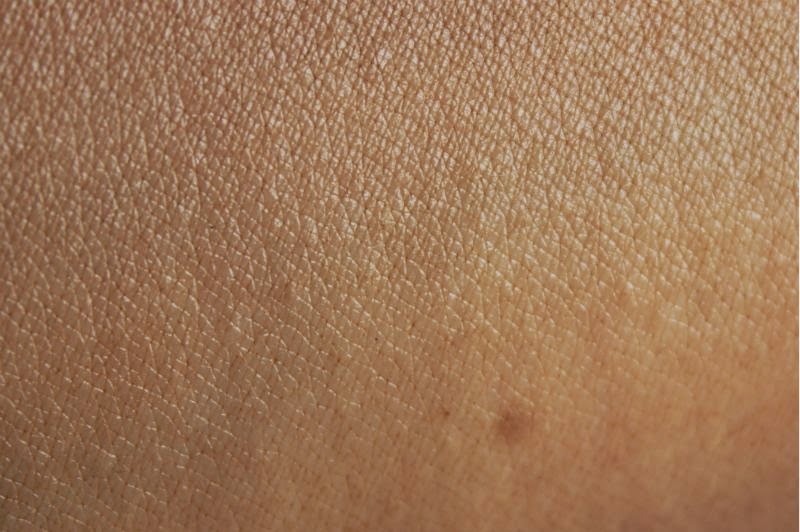 The texture of this foundation is very, very light and loose - to apply you really have to shake the bottle as it has a tendency to separate otherwise. In my opinion this is a foundation you want to apply using your fingertips as brushes and sponges will absorb this like no business and at £33 a bottle the last thing you want to do is waste a drop. I've saw a few reviews stating that Chanel Vitalumiere Aqua Foundation is not suited to oily skin but I sit on the other side of the fence - I think the soft, velvet texture works really well on oily to normal skin but would be the devil reincarnated for drier skin types. 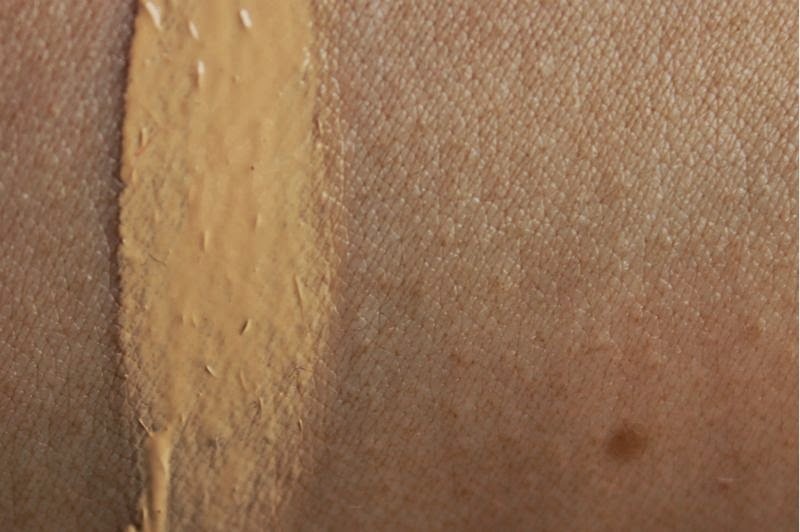 The thing with this foundation is that the coverage is so natural and light, it lightly masks imperfections without caking but I warn you now this will cling to any and I mean any dry patches. 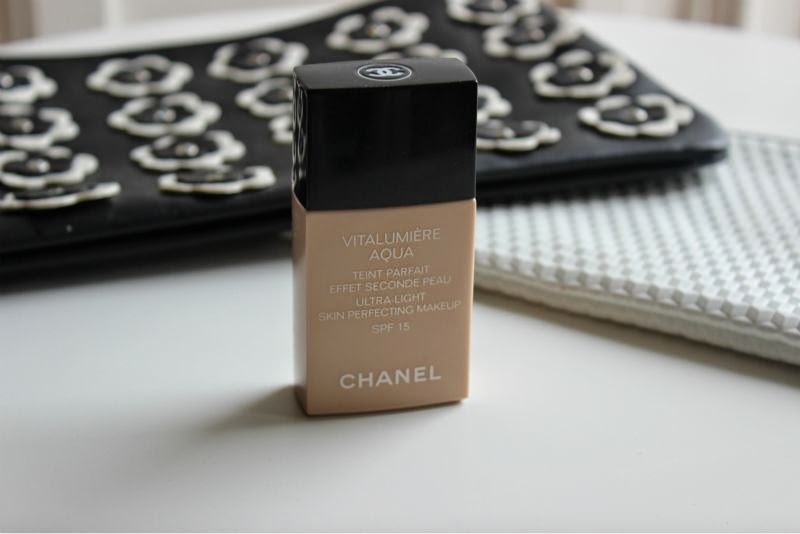 Chanel Vitalumiere Aqua Foundation has a light almost matte finish which most would describe as being velvet, it gives a soft focus finish but it won't truly disguise enlarged pores et al for that you will need a primer. The main reason I rather enjoy Chanel Vitalumiere Aqua Foundation is that it helps even out my skin tone all the while looking rather natural and controlling excess oil which I believe is down to the high alcohol content which of course can be drying and is the main reason anyone with drier skin should steer well clear. I really wanted to love this foundation but just couldn't! It doesn't agree with my skin *sad face*.